Check the stats. Go over your game plan. Make a course correction to achieve your wellness goals. They’re the kind of moves you make when your population completes a health risk assessment and you evaluate the data. In this high-stakes game of wellness and disease prevention, you’re going to face off against the toughest team in the league, Chronic Disease. Its players include heart disease, high blood pressure, obesity, high cholesterol, and diabetes. 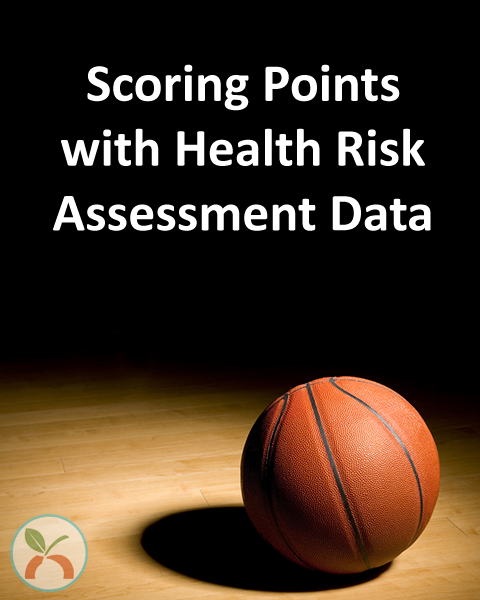 But if you play the game well, an effective health risk assessment can help you score some points to promote health, prevent disease, improve productivity, and send Chronic Disease a message. It’s been a few days since the buzz of March Madness came to an end. The North Carolina Tar Heels beat the Gonzaga Bulldogs 71-65. Watch the replays, and you can see what went right and what went wrong. That’s essentially what happens when you take a look at health risk assessment data for your team – your population. You can see what your population has been doing well, where improvements need to be made, and what health risks might be on the sidelines waiting to strike. So were you rooting for the Bulldogs or the Tar Heels in the finals? Wellsource CEO Chris McReynolds sided with the Bulldogs, even though he wanted Duke to go all the way to the Final Four. Instead, Duke was beaten early on by South Carolina, 88-81. Watch the replay, and you’ll see what went well, and what didn’t. Give your HRA data the same kind of attention, and you’ll be able to help your team improve its scores. There’s a reason coaches and players watch countless hours of game footage and analyze replays. Replays are a tool that helps you improve your game. They provide a glimpse into the strengths and weaknesses of your team. Noticing small details can even help predict moves your opponent will make based on plays they made before. It’s intel you need to help your team ramp up its game. Health risk assessment data works like that, too. It helps you look at current behaviors and risk factors for your team. It helps you identify areas where behavior change can lead to improvement. And if you engage your team with well-planned interventions, you can coach them to a victory against the team everyone wants to beat…Chronic Disease. Watch the replay of the final NCAA tournament basketball game, and you’ll see Gonzaga’s 7-foot-1 Przemek Karnowski go head-to-head against North Carolina’s 6-foot-10 Kennedy Meeks. You’ll see a slew of rough plays, racking up a combined total of 44 fouls. You’ll see an evenly matched rebound battle. And you’ll see where the Bulldogs faltered, particularly in turnovers. What does your HRA data tell you about your population? If you want to go up against Chronic Disease, drop some three-pointers, throw in some slam-dunks to please the crowd, and win the game with a big lead, you need a game plan your players will stick to..
To improve the health of your population, prevent or manage disease, and control healthcare costs, you need to know what’s happening with your team. Health risk assessment data gives it to you straight, says the Society for Human Resource Management. It’s a bit like those post-game locker room interviews with coaches and players. It’s raw data. When your population completes a health risk assessment, you have a snapshot of what they’re doing well and what health risk factors need to be addressed. When a coach watches a game replay and sees a major flaw, the next round of practices typically include specific drills to make the team better. Coaches do this, especially after a big loss. Watching game replays reveals patterns, behaviors, and weaknesses that can be improved upon. There’s no doubt that Gonzaga Basketball Coach Mark Few and Duke Basketball Coach Mike Kryzewski are both looking at ways to improve their teams, and make another run for the NCAA title in 2018. Your HRA data can help you do the same thing. Want a healthier population a year from now? If you discover your population is obese, has high blood pressure, or is at risk for diabetes, take action to reduce this. What happens when someone on your team completes an HRA and learns they’re at risk for heart disease, diabetes, or some other chronic condition? Ideally, it provides motivation to change (losing a game can do that, too). They visit the doctor, get the care they need, and make lifestyle changes to reduce their health risks. It’s a win for the individual and for your entire team. Achieving wellness goals and reducing health risks is a bigger win than any basketball upset. But to outscore Chronic Disease, you’ll need to figure out how to best help your population prepare to go up against this formidable team. Collect HRA data. Watch the replays. And you’ll have the insight you need to help your team be healthier, happier, and more productive. We think it’s about time Chronic Disease gets bumped out of the bracket. The key players on this team have wreaked havoc on healthcare costs and quality of life long enough. And the replays show that they can be beat with lifestyle changes and proper medical care. Is your health risk assessment helping you win at wellness? Let’s discuss in the comments below.